A new title! 1 pt? 0 pts? you may equip upgrades with ‘small ship only’. finally, Linked Battery, Vectored Thrusters, cloaking device! And Deadeye comes back! Intensity, Juke, all the EPTs denied Boba. Debris gambit could be a bit silly tho. of course there’s not much of a chance ever seeing this outside of a scum Ace pack (very rare) or a campaign box. Still, I don’t think it will come close to OP but I think Firesprays or at least Boba would be viable. Make it unique ... not bad. I'm CoffeeMinion, and I approve this message. There hasn't been a "unique pilot only" upgrade, but that might keep generic firespray lists from having crazy wingman combos. @GrimmyV, this would be awesome. Not sure if my suggestion means anything but maybe treat it like the StarViper Mk. II where it lets you take two titles and Boba can still take the Slave 1 title as well? Stolen Transponder Codes. Modification, 2 points. 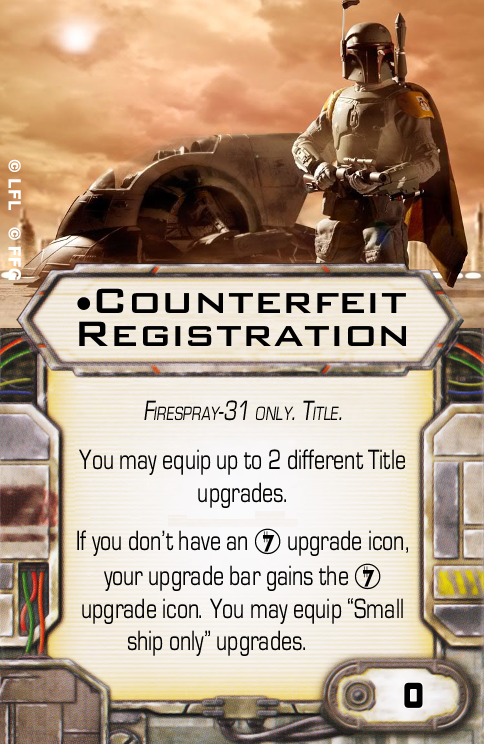 You may ignore restrictions on unique Title upgrade cards. Honestly what the Firespray needs is Barrel Roll and it would probably be actually meta-viable. The Firespray has a terribly outdated dial, that's the core issue of the ship. It would definetly benefit from gaining a barrel roll, but if it comes at the cost of 2 points and the renounce of Engine Upgrade we are still at square one. On the fly casual x wing simulator, their firespray fix was "you may equip a second title, and you may fire secondary weapons out of your rear firing arc." I thought about this a bunch a while ago. Title: Customs patroller. Imperial Only. Firespray only. Gain a crew slot and a system slot. You may equip upgrades which are Small Ship Only. You may equip one additional Title upgrade card. You may equip one additional Title upgrade card. 0 points. Illicit: 1 point. Gain a crew slot. You cannot equip unique crew upgrades. Title: Gunrunner. Scum Only. Firespray only. When you reveal a 1 bank manoeuvre, you may instead execute a white 1 turn manoeuvre in the same direction.You may equip upgrades which are Small Ship Only. Add Barrel Roll to your action bar. You may equip one additional Title upgrade card. 0 points. Krassis Trelix: Prepend ‘You may attack with secondary weapons from your auxiliary arc’. Imp Kath Scarlet: No change. Imp Boba Fett: When you reveal a bank manoeuvre, you may change its speed OR bearing to any bank manoeuvre of the relevant direction or speed. The new manoeuvre cannot be changed again. Emon Azzameen: Add EPT to upgrade bar. Scum Boba Fett: No change. Firespray has too many titles. What it needs is a point cost reduction. Why not also fix the Imperial Firespray? EDIT: Frack, if we are going for a "fix", let's keep it 0 points. @Odanan, what about a negative points title upgrade and adding either the Boost/BR to the action bar? I think the illicit addition would be clutch on the Imp Firespray! @GrimmyV, go to your room!! Bad X-Wing player! Bad!! Bad!!! Personally, I'll take any Firespray expac that features Jango and a repaint for his Slave I. There had to be 30 preceding variants before this one. . . While gaining slots is fine and dandy, I need a card that allows me to build a viable 33-point Firespray because... reasons. Barrel rolling and boosting large ships is ridiculously powerful. That’s why Vectored Thrusters and Cloaking are only on small ships and why Engine Upgrade is 4 points. Thats a pretty good list of things you could work with. Punishing One to get +1 red die, Mist Hunter for a barrel roll (at 1 point only! ), and Havoc are the best choices. Honestly, I'd go with the Mist Hunter just to make Boba more maneuverable. Yup. I honestly cant think of a current unique title that would be OP on it, mostly because it's overpriced and unique. You could make it 4 primary... but then its costing 50+ points. You could give it a HLC turret. But ditto. You could give it sloops. Etc etc etc. It's my favourite of the long list of fixes I like for it. Alliance overhaul, and to a slightly lesser extent spec ops are the only two that might be broken. Both give 4 dice front primary, one gives focus to a crit on rear, other allows possible double shots. And both cost 0! AO would be brutal on scum kath. EDIT: Missed the unique title part. Which is a shame as most generic titles would help the firespray.